Miss Movin On, under jockey G.R. 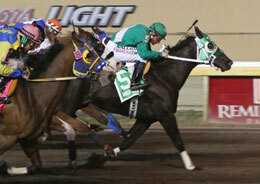 Carter, Jr., winning the Oklahoma Paint & Appaloosa Futurity(G1) at Remington Park on Saturday night. OKLAHOMA CITY, OK�MARCH 22, 2014�Champion jockey G.R. Carter, Jr. guided Miss Movin On to her first stakes win Saturday night in the $139,600 Oklahoma Paint & Appaloosa Futurity(G1) at Remington Park. It was the first win in two career starts for the IVORY JAMES filly out of Texas Fourwinds, by Texas Hero. Dee Kenner conditions the Charles Leggett homebred for owner Wade Leggett. The filly broke on top and held sway throughout holding off Ugly Kid Joe by a neck at the wire. She completed the 300 yards in :15.488 seconds to pickup the winner's purse of $53,648. Texas Spook finished third, followed by Panther Quick Flash, Big Red Kadillac, Sf Stelle The One, Cashmere Queen, Shadow Be Quick, Mai Dashing Hero and Southern Snow.